Poor Sebastian Vettel. It's been his lifelong dream to drive for Ferrari's Formula One team only to get there when the team's a hot mess. 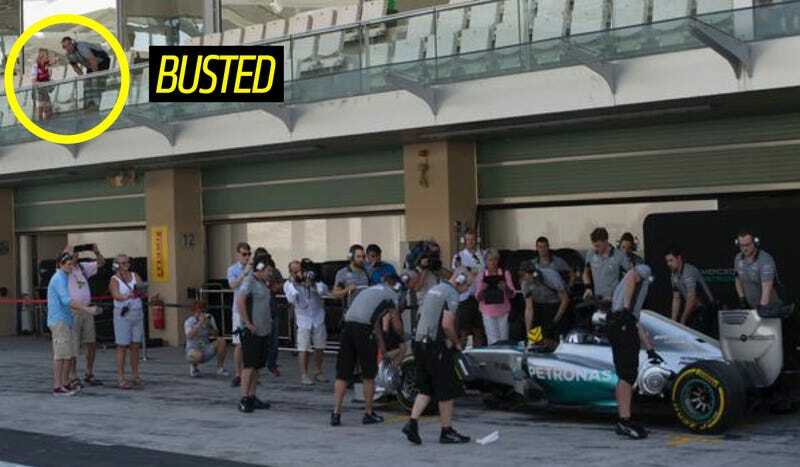 Most recently, they've been caught red-handed with a thermal camera above the Mercedes pits. These pics come via Miquel Liso on Twitter, who asked, "Could someone explain me what was this girl @ScuderiaFerrari doing above box of @MercedesAMGF1 with a termic camera?" I mean, she is right over the Mercedes pit stall while the car is pulling in, and Mercedes has been the ridiculously dominant team to catch in 2014. Well, um. Hmm. Clearly she's doing what any other self-respecting person would do with a thermal imaging camera and monitoring for farts, right? Here's the other photos of Ferrari definitely not spying on their competition, and totally scoping for farts with the FartCam. Clearly, lots of NOT SPYING going on there. One of the Mercedes team officials, however, didn't see it as a FartCam. Unfortunately for anyone trying to study the effects of track food on Formula One teams' flatulence, thermal imaging cameras can be used to study where heat is concentrated on the car itself, thus giving some clues as to its design. Yeah, that's gonna be a talkin'-to. Ferrari, time to sack your entire Department of Sneaky Business, too. Clearly, they're not good at keeping this kind of stuff under the radar. Maybe you can hire someone from Red Bull now that Seb's there. All images belong to @miquelliso.